Citrix did a lot of announcements on cloud products the last year(s) as Barry Schiffer already covered here. One of the core products of this cloud offer is the Citrix NetScaler.. Or AGEE.. Or AGE.. So after discussing this several times with customers I decided to write a blog post on the difference in Citrix NetScaler products and versions. MPX Full portfolio of hardware-based app delivery appliances delivering 500 Mbps to 120 Gbps of performance. VPX Software-based virtual appliances that run on widely deployed hypervisors and support 10 Mbps to 3 Gbps performance levels. SDX Hardware-based appliances with advanced virtualization to consolidate up to 40 independently-managed NetScaler instances with up to 50 Gbps of overall performance. NetScaler on AWS The full suite of NetScaler capabilities is now available on the Amazon Web Services (AWS) environment. So the first choice is the base platform, can you do with a virtual appliance or do you need a physical appliance? Based on “With Citrix AG and CSG going away, how far can you get with NetScaler VPX? The answer: pretty far!” by Julien Stanojevic you don’t have to go with scaling figures provided by Citrix. Although the MPX and SDX do have additional hardware to offload SSL to the NetScaler so that can be of influence when choosing your platform. The Citrix NetScaler ADC is the Citrix solution for load balancing and content switching, application offloading, attack protection, application firewalling and more. It enables the datacenter network to become an end-to-end service delivery fabric to optimize the delivery of all web applications, cloud-based services, virtual desktops, enterprise business apps and mobile services. This should be an easy decision as well, if you need a more technical explanation of these features you can use the NetScaler Data Sheet. So far so good one would say so I went to the Citrix download site just to get some screenshots from the downloads and there’s more NetScaler goodness as the NetScaler ADC, the NetScaler Gateway, NetScaler AppFirewall and NetScaler Branch Repeater are listed there! The Citrix NetScaler Gateway (formerly Citrix Access Gateway) is the renew CAG on the Citrix NetScaler code. Basically you get a NetScaler limited in functionality for remote access only.. It starts like a normal NetScaler until you upload the license file and after the upload you’ll get a limited interface although this NetScaler Gateway offers great scalability for remote access. AppFirewall ensures Payment Card Industry Data Security Standards (PCI-DSS) compliance through its PCI-DSS support and reporting tool. The compliance reporting tool shows AppFirewall settings relevant to PCI-DSS, how they should be configured and if they are being met. If a setting is found to be non-compliant, AppFirewall provides steps to rectify the situation. As far as I can tell the AppFirewall is an edition to the Citrix NetScaler Enterprise Edition. The Citrix NetScaler Branch Repeater is merging with the Citrix CloudBridge product family to provide a WAN optimization solution to scale services securely across branch, datacenter and cloud. Citrix Branch Repeater provides a service-centric WAN optimization solution that accelerates, controls and optimizes all services—desktops, applications, multimedia and more—for branch and mobile users while dramatically reducing IT costs. I hope this article will shed some light into the dark of the NetScaler jungle and the choice on platform and versions can be made based on a clear comparison of versions and features. Should be noted that Access Controller only works with Access Gateway 5.x which is approaching End of Life. 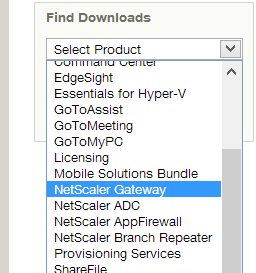 It does not work with any of the NetScaler Gateway products. Personally I would consider it legacy and not worth mentioning. The bottom two aren’t actually NetScalers though are they. They are CAG 5’s and not based upon the NetScaler platform at all. So these two which as Shaun rightly says are approaching EOL; are Citrix actually referring to them as NetScalers? I agree with you but when you go to the download page you’ll see this list of downloads. The CAG’s are listed there so that’s why I mentioned them as Citrix is doing the same thing. Nice blog! Some minor comments from my side, aslo in addition to Andrew: In regards to NetScaler Gateway there is only one currently sold functional model, NetScaler Gateway. Form factors are VPX (indeed the NetScaler where features get limited based on license file) with max 500 ICA users, a Physical appliance with NetScaler Gateway only enabled (5500 model) and NetScaler Gateway is ALWAYS included in all NetScaler versions (std, ent, plat.). CAG 4.x / 5.x / 2010 are end of sale! Still supported, not no longer sold so no longer available! AAC is still available for CAG 4.x but not required for 5 and NetScaler Gateway. In regards to NetScaler ADC, there are 2 more “versions”, the Express (free, 5 Mbit, 15 NG users 13 month lic, NS standard features) and the developer edition (for NetScaler customers with support, 13 month lic, 1 Mbit, NS platinum features). In regards to the Branch Repeater, you will see that all those products will be moved to the new name, Cloud Bridge, te coming time. NetScaler BR name will disappear. I know, product names and Citrix.. 😉 but is is a little more clear now. We have 2 products (NetScaler and Cloud Bridge). You pick the NetScaler function (NG only, std. ent. or plat), and for both NetScaler and Cloud Bridge, the performance you need (SSL numbers + bandwidth) and off you go!